Vector graphics need not be one-dimensional. 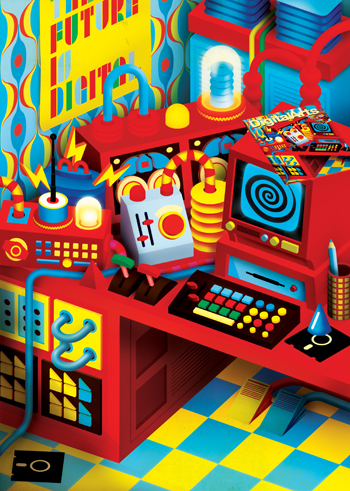 In this tutorial, Thomas Burden – aka ‘…and there will be unicorns’ – shows how Adobe Illustrator’s 3D extrusions and Map Art function can be used to create an imaginary room full of weird, wonderful and definitely retro computer kit. Although pretty basic, these faux 3D functions in Illustrator can generate an infinite number of cool shapes and elements that can add a whole new dimension – literally – to working with vector graphics. You can add further depth by shading these elements, either in Illustrator or, with a great deal more control, by importing them into Photoshop. Step 1 As you’ll see when you open Digital Future.eps from the Download Zone, I have created a few basic elements to save you time – not that drawing two circles takes much time, though it’s a little more involved to make the patterned strip shown from a red rectangle and a repeated stroke. As all the components in the final image are created essentially using one process, we will demonstrate by making just one of the objects – the ‘bellows-in-a-bell-jar’ thing, seen sitting atop the ‘reel-to-reel-machine’ thing.